Today, Martin Yale, a U.S.-based manufacturer of print finishing, office, and mailroom equipment, announced its newest product, the KF-250 Stand-Alone Knife Folder. The product is being introduced in Martin Yale’s booth #3834 at this week’s PRINT 17 event, September 10-14, 2017, at McCormick Place South in Chicago, IL. The KF-250 is designed specifically to quickly and easily fold heavier-weight digitally produced media (up to 350 GSM). Heavier weight digital media coming off slitter/cutter/creasers can’t be folded in-line or on most buckle folders. 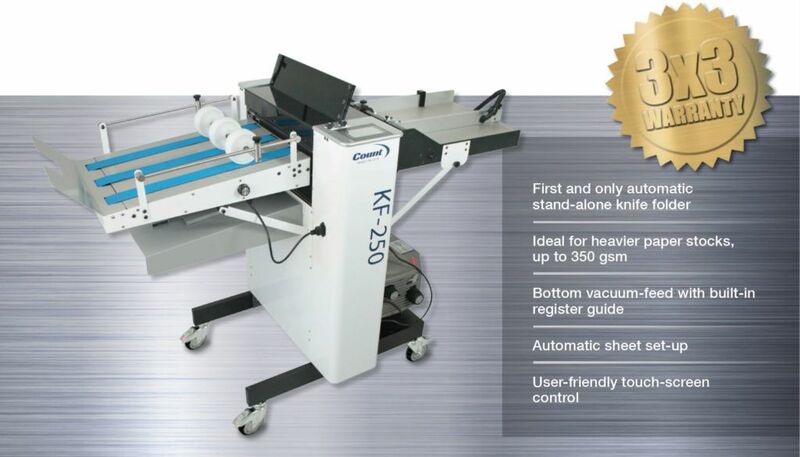 The KF-250 is ideal for anyone with an existing creasing machine or a multi-directional slitter/cutter/creaser. It features a bottom vacuum feed with register guide and a user-friendly touch-screen control with speeds up to 4,300 sheets per hour.